All classes are 30 minutes in length once per week. Monday – Friday 9am – 11:55am. Monday – Thursday 3:25pm – 6:55pm. If you have questions on levels or abilities, please contact us so we can help find the right class for you. #262-512-7946. This is a Parent / Child class with a primary focus on safety. No prior swimming experience required at this level. We want your little one to feel comfortable and happy in the water. Our teaching techniques are creative and loving and we always teach in progression. Our main focus is to teach swim and safety skills along with proper holds, rolling over on the back, reaching for the wall, breathe holds, kicking, and having fun! 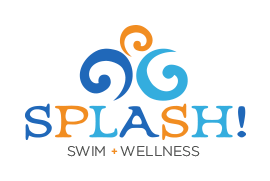 This class is designed as a transitional class which will prepare children for our Splash Mini class (where parents will be completely out of the pool area.) During the course of Baby 2, parents will sit on the edge of the pool assisting and interacting with their children, while they take turns working with an instructor. We will be working on water safety skills during class with parents out of the water; as well as gliding, floating, and swimming independently. This is a class without a parent. We understand that some children may be nervous. Our teachers are trained to handle these cases in order to comfort the child and continue to work on swim skills. This is an introduction class for swim and safety skills along with breath holding, front and back floating, kicking, and using underwater arms. Our goal is independent short distance swimming. This class is recommended for children who have previously had a class without the parent. The student should already be swimming a short distance independently and using underwater arms. The goal of this class is greater distance independent swimming, roll over from front to back, back to front again and more advanced swim skills. No prior swim experience required for this class. This is an introduction class for swim and safety skills along with breath holding, front and back floating, kicking and using underwater arms. Our goal is independent swimming. The student should already be swimming a short distance independently and using underwater arms to enter this class. The goal of this class is to build the distance of swimming, roll over from front to back, back to front again and more advanced swim skills. The student should already be swimming independently, ability to roll over, and have an understanding of advanced back skills. The goal of this class is to build the distance of swimming, work on all kicks, (flutter, dolphin, breast), and teach advanced breathing skills. No prior swim experience required for this class. This is an introduction class for swim and safety skills. Prerequisites: students should be swimming at least 10 feet with arms coming out of water and coordinating their kicks with the arms. They should also be able to roll over from back to front and front to back. The child needs to be able to swim elementary backstroke, back float independently, and do flutter kicks on back with sculling arms. Introduction to side breathing on both sides (25 feet). Introduction to backstroke, breaststroke and dolphin kicks. Students should be swimming freestyle with bilateral breathing 25 feet. They should be able to swim elementary backstroke and backstroke. Students entering into this level should also have a basic knowledge of the breaststroke and dolphin kicks. Students should be swimming freestyle, backstroke and elementary backstroke 50 ft. They should also be able to perform the breaststroke kick and the dolphin kick and have the ability to tread water. Students should be swimming 100 ft independently. They should also be swimming breaststroke, butterfly, and treading water for 1 minute.